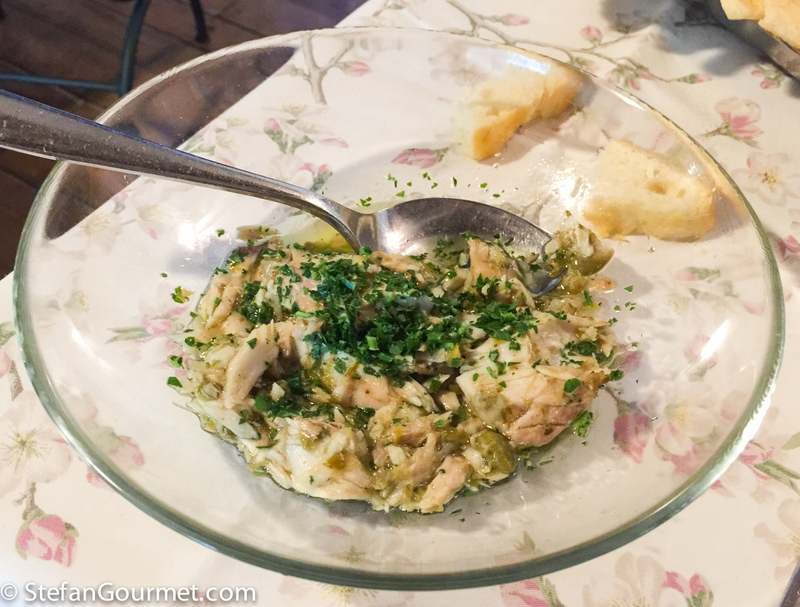 For our final night in Italy we went to another famous trattoria with 3 gamberi from Gambero Rosso: Locanda delle Grazie in Curtatone, on the border of the Parco del Mincio. The Mincio is the river that changes into a lake here. We have moved from Veneto into Lombardia, into the region of mostarda, tortelli di zucca, and cotechino. To start with, we ordered mixed antipasti called “triumph of Mantovanità” on the menu. We shared a single portion, which turned out to be a good choice as even a single portion was a lot of food. The waiter advised to upgrade it and throw in some cotechino as well. We asked to suggest a local wine, and he suggested a chardonnay from Alto Mincio that indeed went very well with the food. 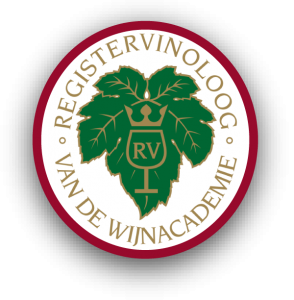 It is not often that you ask a waiter to recommend a wine that he recommends a bottle that is only 10 euros (and good!). 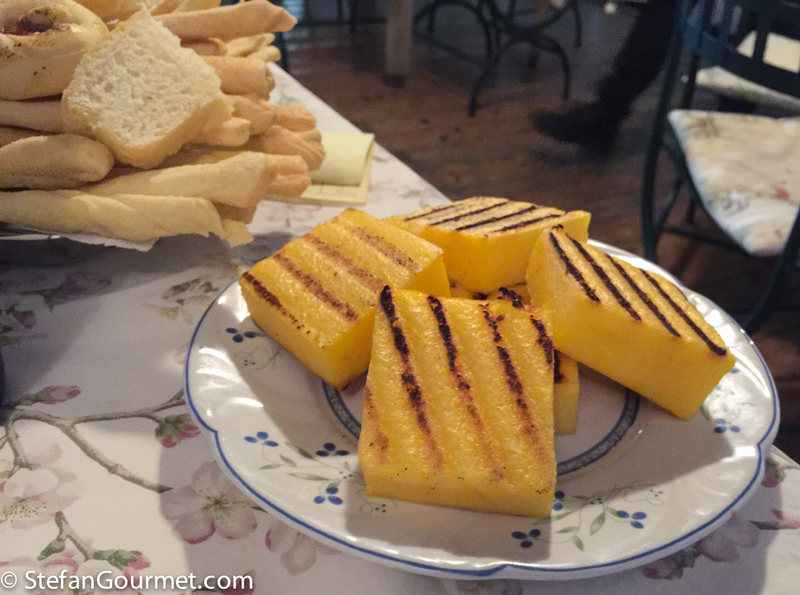 The antipasti came with grilled polenta. 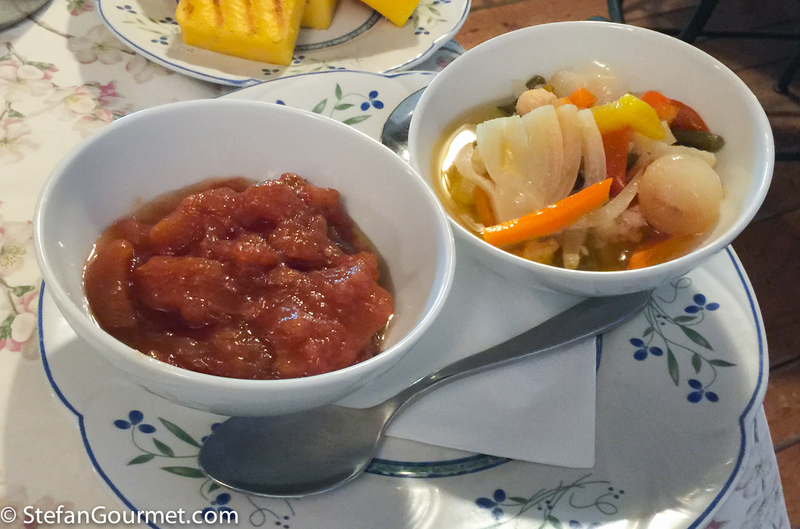 Condiments: homemade mostarda to eat with the Grana Padana cheese, and homemade sott’oli to eat with the salumi. Mostarda is fruit that is preserved with sugar and mustard. This was pear mostarda and nicely soft. Sott’oli are preserved vegetables. 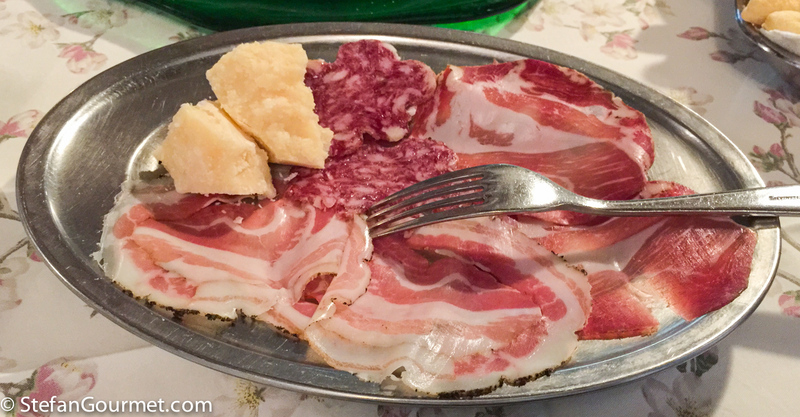 Aged Grana Padana cheese and salumi: pancetta, coppa, and salame. 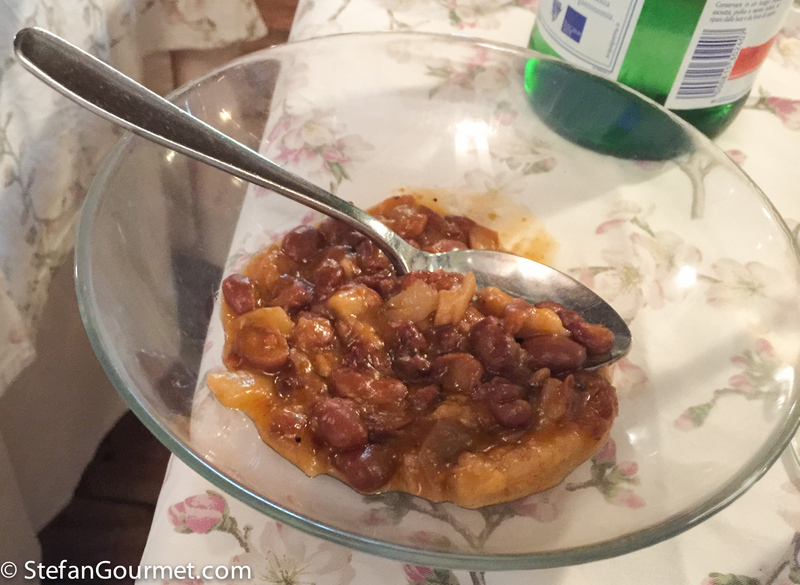 Stewed cotiche (pork skin) with beans. 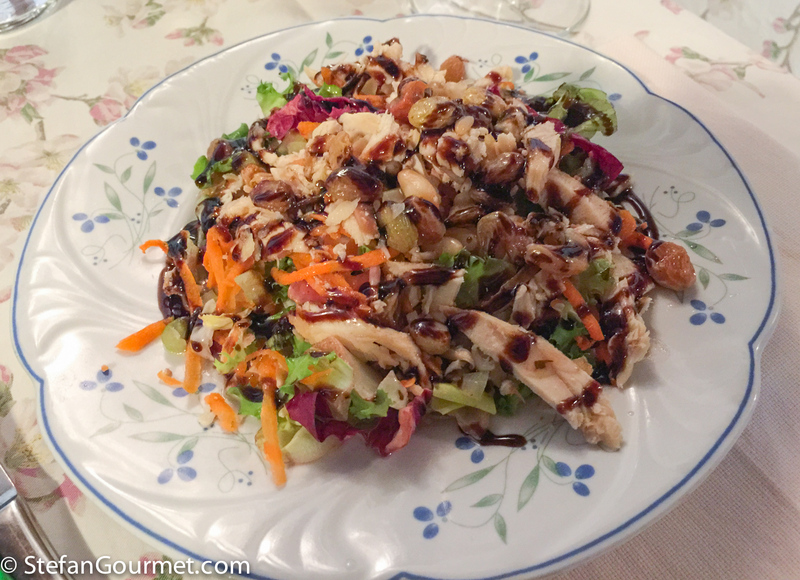 “Gonzaga” salad: salad with chicken and balsamic vinegar. 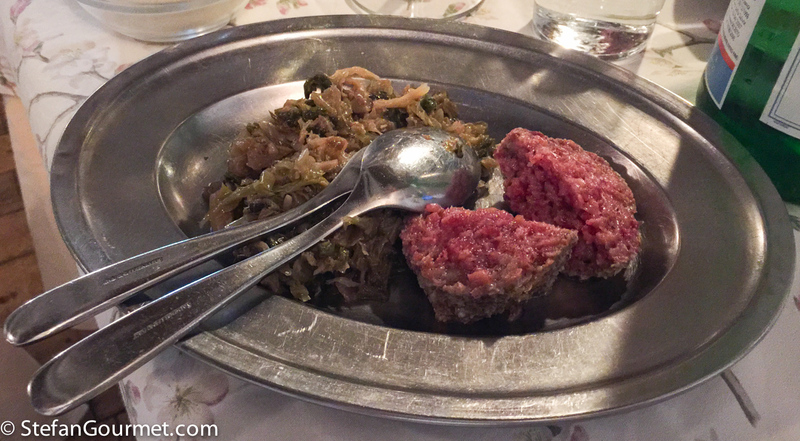 Cotechino, the soft local pork sausage that melts on your tongue, with homemade sauerkraut that was made with savoy cabbage instead of white cabbage (the usual for sauerkraut). 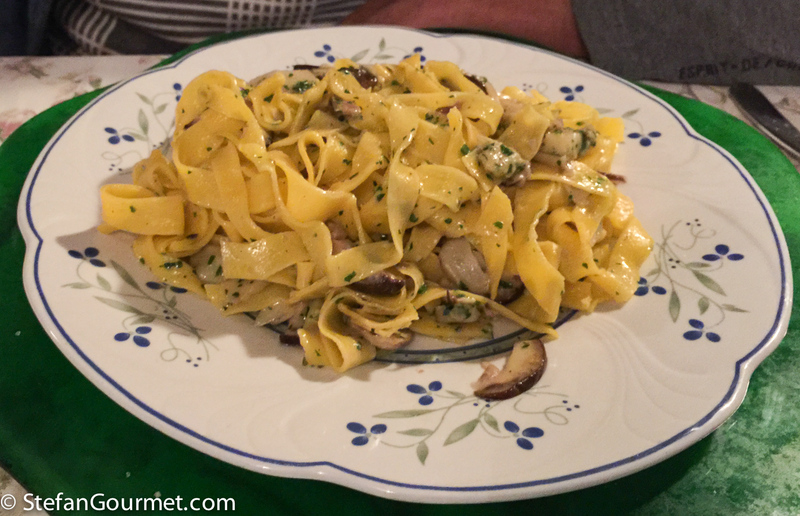 Kees had the same homemade tagliatelle, but with fresh porcini mushrooms (in season right now). We should have shared the primo as well, because unfortunately we had no more room for secondi. 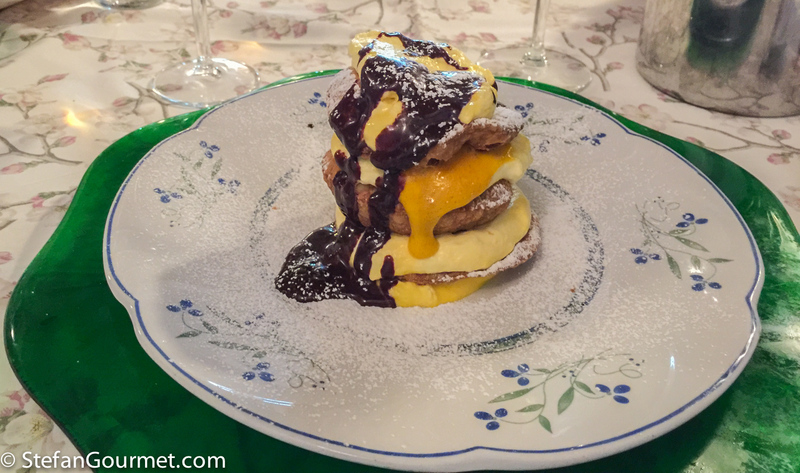 With this a glass of dessert wine, also from Alto Mincio, a passito made from garganega and moscato. Locanda delle Grazie offers outstanding value. The check for both of us was only 80 euros. The food is delicious, everything homemade and very tasty; 9/10. The service is very friendly and helpful with the menu, which could otherwise be intimidating if you are not familiar with the typical dishes of the region. 9/10 for the service as well. This is a great trattoria! Tipico pasto alla mantovana! In tutta la zona a Sud del Lago di Garda, anche nella provincia di Verona che confina con quella di Mantova, si mangia in modo superbo, abbondante e molto saporito e si paga un conto molto modesto. 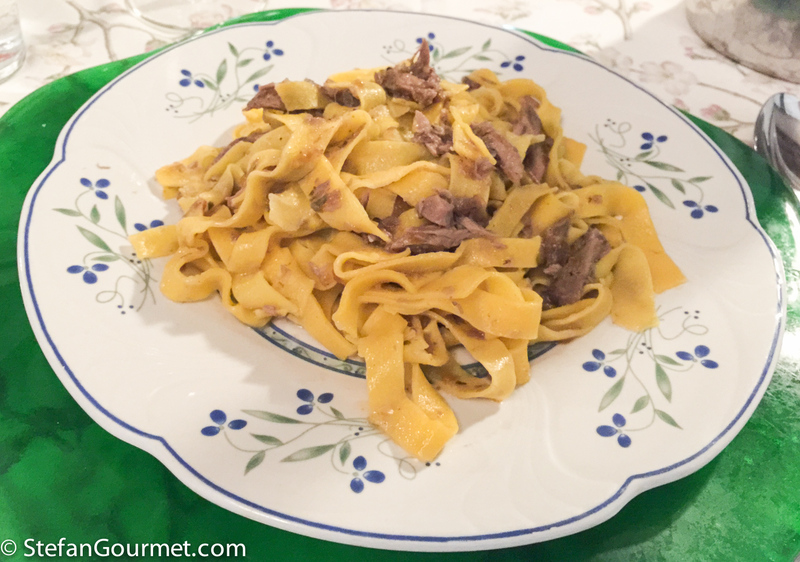 Life moves in circles: after decades of trying to get to every ‘star’ restaurant I could around the world, now these kind of ‘trattoria’ meals are much more appealing to me and I think this Lombardian inn is just about my favourite of your current Italian venture. Loved the look of the ‘cold cuts’ plate, well all the antipasti actually and had never thought of tagliatelle with duck. Had no idea Northern Italy used sauerkraut but it looks so good with the cotechino . . . OK, the Asian style meatloaf [!!] just out of the oven here does smell inviting . . . 🙂 ! Thank you for the many moments you have shared. The detailed descriptions and photography are magical and leave one to feel as an invisible guest at these restaurants!